Honestly I never go to the fiesta. I am not one for waiting in long lines of traffic for anything. 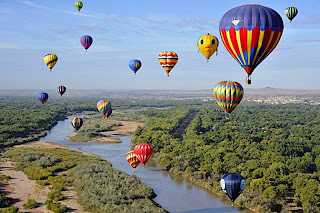 Nonetheless, I do enjoy seeing the balloons floating over Albuquerque. They are really beautiful. Sunday night we happened to go to Sandiago's for dinner. It is located at the Sandia Tram and you can pretty much see the whole city of Albuquerque below. 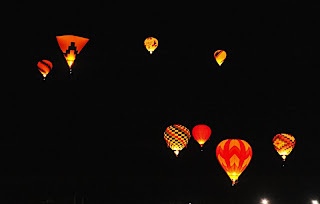 You couldn't see much of the balloon glow, but the fireworks afterward were really a nice touch to dinner -- like a free dinner show. 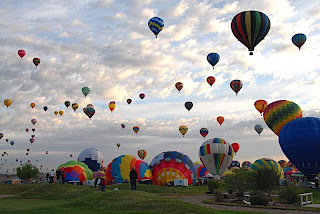 I leave you with some photos that I stole from The Balloon Fiesta Website. BTW, the pink elephant is my favorite balloon.